I have built models for more than 35 years by know but I have NEVER attempted a four-engined one, not until now at least! So why this quite odd bird? A friend of mine commented when I told him that I had bought a radial Lanc that it was too odd for him. The opposite is true for me: odd enough to appeal to me ! I've always liked the Lancaster with radials. And then the perfect excuse for building it turned up in the shape of the Bombers campaign. I've invested in a moderate amount of after market stuff (there is enough etched metal out there to drive anyone to bankruptcy or into the asylum or possibly both! 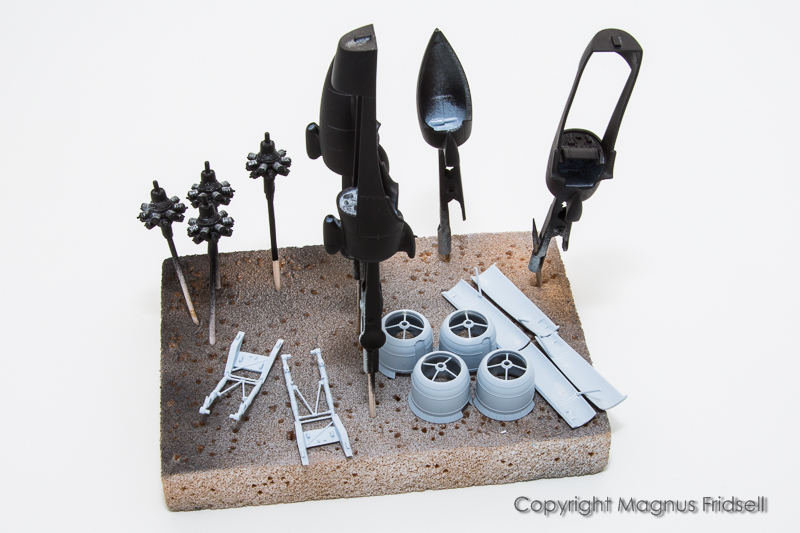 ), I picked the stuff that seems to me to be the most useful: wheels, gun barrels, interior stuff and canopy masks. So, now it's officially on! All seated and buckled up for the ride Magnus! I'm signing up for the full run. As usual, I'm looking forward to watching you work your magic on this build. Friends! Thanks for keeping me company ! I'm working on the interior right now, takes a lot of time for very little result... I'll keep to what can be seen through the canopies and the turrets but it is still a bit of work to do, I might be able to present some photos later this week! Looking forward to this one Magnus. Do you have enough sticks? Magnus, signed up and following along on this build. Like others have said I'm interested to see what you do with this. Count me in! I’m looking forward to seeing what you do with this. Damian! I've recently replenished my stock of sticks, stay tuned! 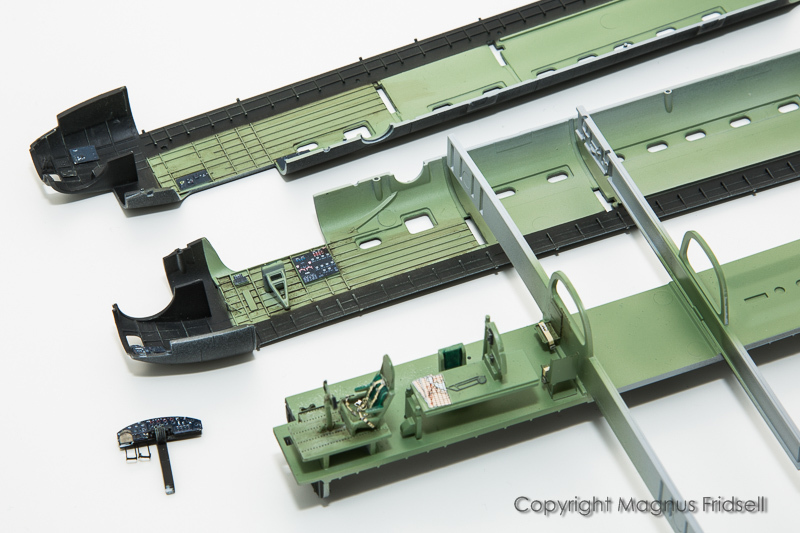 Fuselage halves with most of the kit interior parts installed into them, enhanced once again with the most prominent pe-parts. The surfaces really are a bit rough. 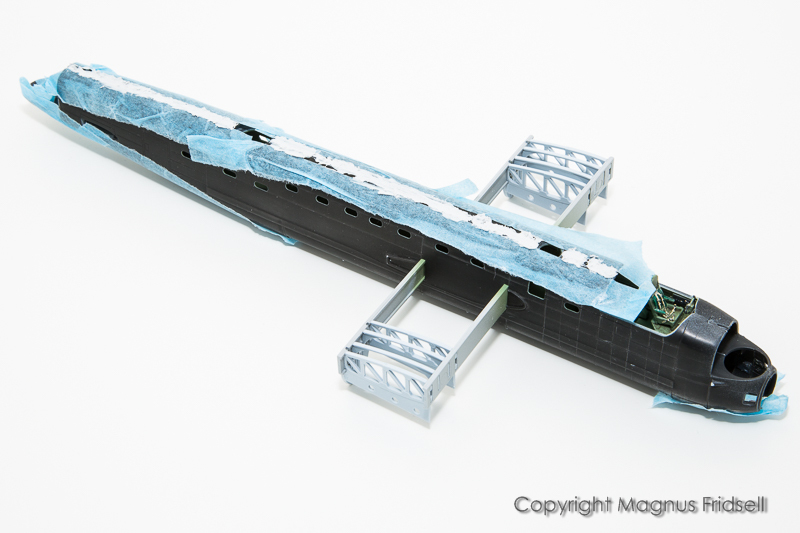 It is up to the individual modeller, many would probably be perfectly happy (and still get a good result!) building the well-fitting model as it is, but I have decided to raise the bar at least a bit. So I have sanded and polished the outer surfaces, primed them using Games Workshop's "Chaos Black" and then polished them again (I did that on the NMF Lightning with good results, in this case I am even doing it in the right order - before the model has been assembled !). Another thing I hoped for was that the primer should fill in the rather prominent panel lines a bit but I doubt it helped much and I don't feel like filling them (with what I don't know anyway! ), sanding them down and rescribing all of them. Enough is enough, at least this time ! Magnus, good luck with the riveting you brave man! Never a dull moment in your build logs Magnus, and as always good honest critique of the kits to inform us all of potential issues. Looking good so far, and I am also very interested in seeing how the riveting turns out. sure looks like the riveting is going to be a major investment in time, but with your skills, I'm more then sure the end results will be well worth your effort. Magnus! Wow! Rivets, what can I say? Friends! Finally back to this project, I put it away over summer but now I actually feel quite inspired! 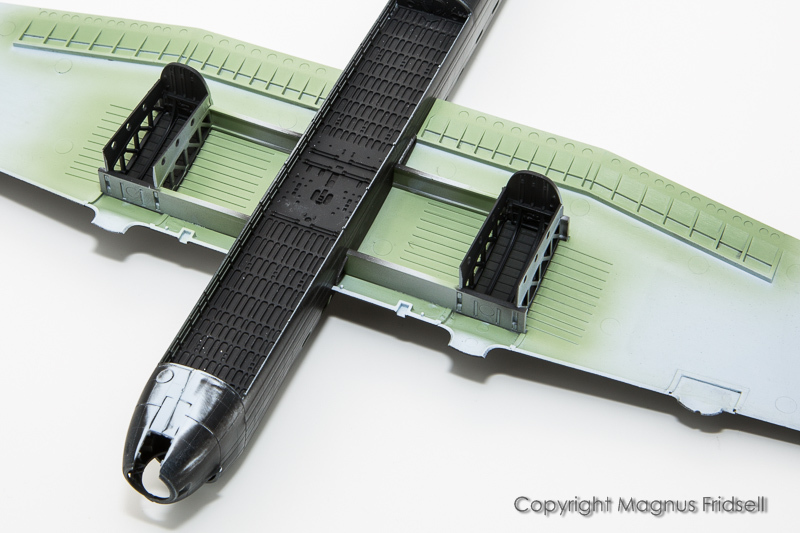 I finally made it through the riveting, more tedious than difficult, and have now closed the fuselage. Interior looks quite fine even if it is far from the original's tremendous amount of levers, cabling and tubing. 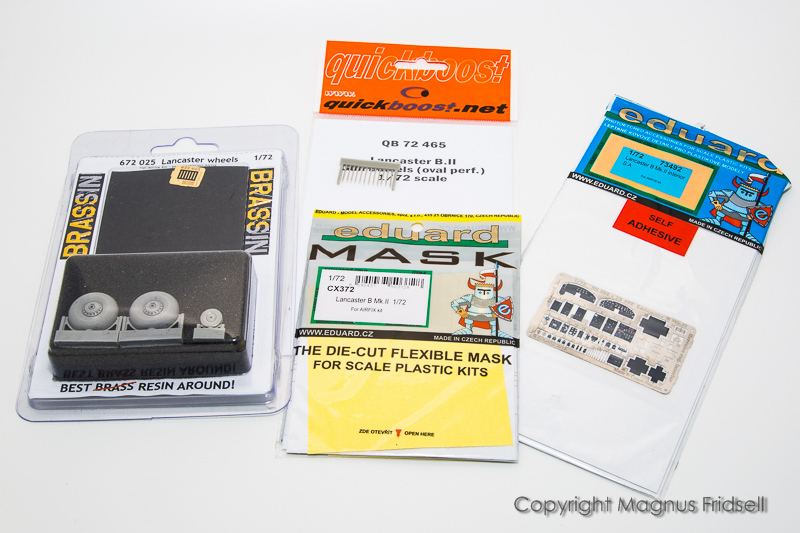 The best part of the Eduard sets were the printed placards replacing various control panels. Out of laziness I left much of the rest of the etch out, the plastic will be perfectly OK seen through the canopy. With out further ado it was glued shut, taped and set aside for hardening over the night! Wings on is the next step. 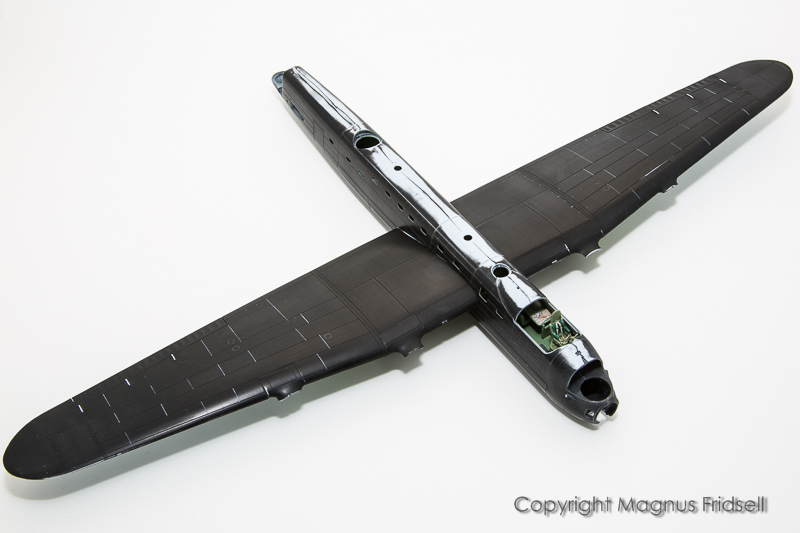 I wish the kit had been designed so that the wings could be slid over the spars as the last tempo in assembly (it will be a quite hefty piece of plastic to handle when fully assembled) but now the wings sandwich over the protruding wing spars / landing gear anchor structures. I'll also have to start working on the turrets soon, I will treat them as small kits in themselves. 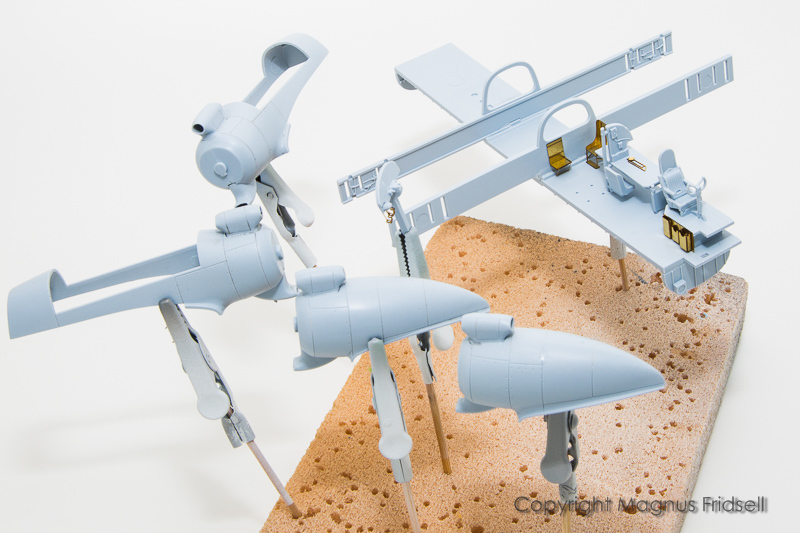 I've also realised that I lied in my first post: I have actually done two four-engined kits before, both Italeri Hercules kits! Sorry for that one ! 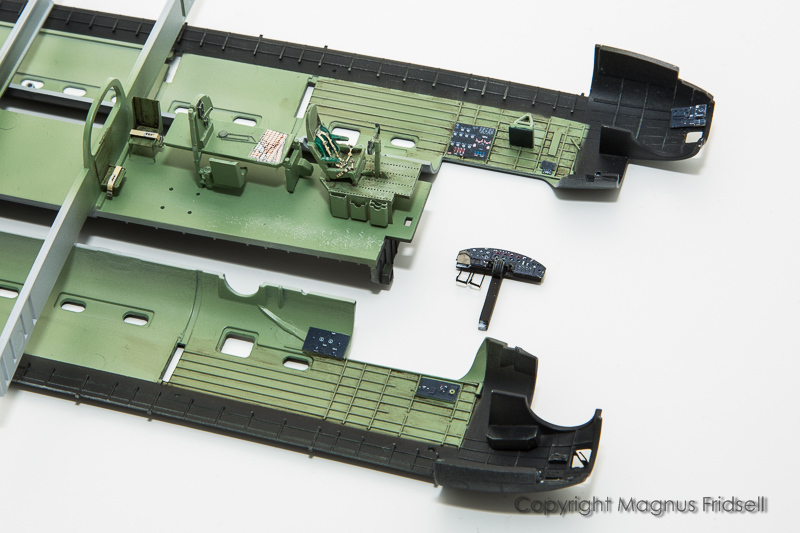 Work on the interior with all that tiny PE parts looks fine, Magnus! Of course I'll keep an eye on your progress as always. Ready glad to see that you're making progress once again on the Lancaster. Excellent decision on just how much added detail the interior really needs. 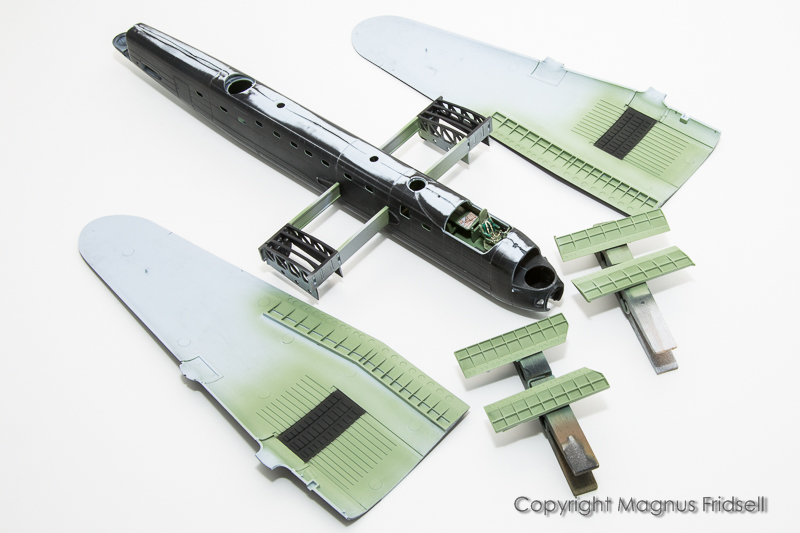 About the biggest multi I've ever built in 1/48 scale is the B-25B and the P-61A, both big twins. Huge models that took a huge amount of time, and forever more a huge amount of display space. great to see this one back on the bench Magnus! Chris and Russell! As ever, I'll try to keep you entertained ! I realise that the Lanc looked like a true putty monster in my previous post, that's a bit unfair and more due to my sloppy work than any real fit problems. Most of it disappeared after a quick and simple sanding! 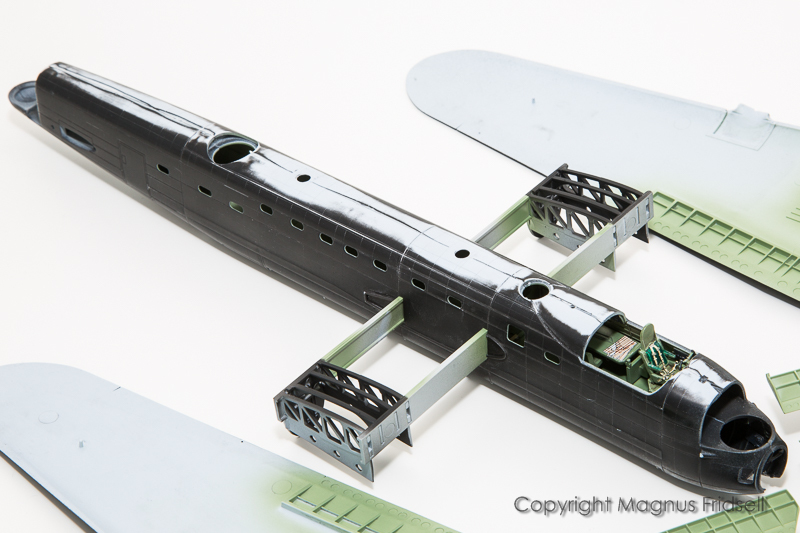 A close-up of the fuselage, I've painted the parts of the wing spars that will be seen through the landing gear wells and the deployed flaps. Top wings fixed in place. And this is how it looks like butter side up! 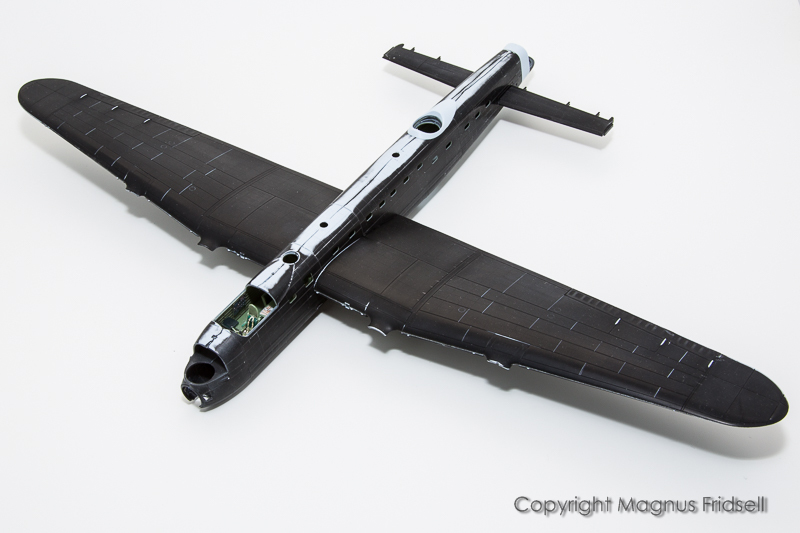 With a bit of luck the lower wing halves will be glued later on tonight. Looking real good. How come you're adding the bottom of the wings separately? Glad to see you back with it, Magnus! And what a fine work you did meanwhile! I have that Airfix Lanc in my stash waiting to someone gets a hand on. Struggeling with the space I need as it's still huge even in 1/72. outstanding work with the interior. I especially like those little things like the maps on the table. Great! Friends! Thanks for your encouragement, I wish I could post more frequently but since many things are x4 it takes much more time to get to the photogenic milestones ! Regarding the wings, the kit is simply designed this way. 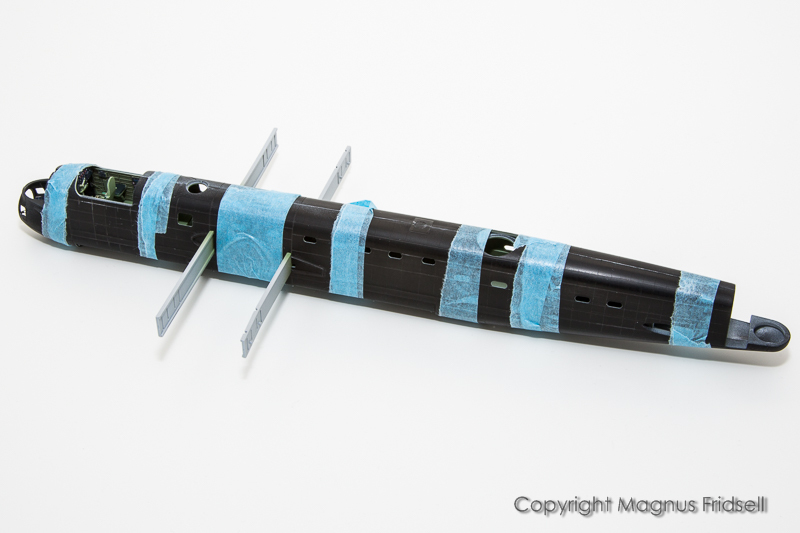 It is not possible to glue the top and lower half together in the traditional way, they have to be sandwiched around the wing spars. It makes for a strong and self-aligning model so I can live with it ! 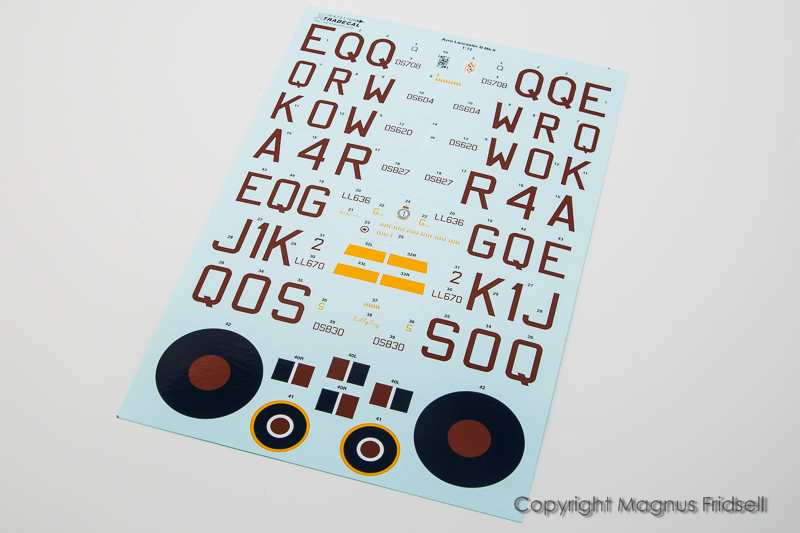 And that map was supplied by Airfix as a decal, really thoughtful of them I would say ! Bits and pieces! Many parts have sink marks or ejector pin blemishes, none of them are especially difficult to deal with but it has to be done and it takes time. One thing I regret now is that I glued the struts into the engine cowlings, I should have waited with them until I had filled and sanded the collector rings that are integrated with the cowling halves. Fit isn't perfect and it is tricky to sand here when the struts are in place. Another operation that took some time was thinning the cowl flaps. 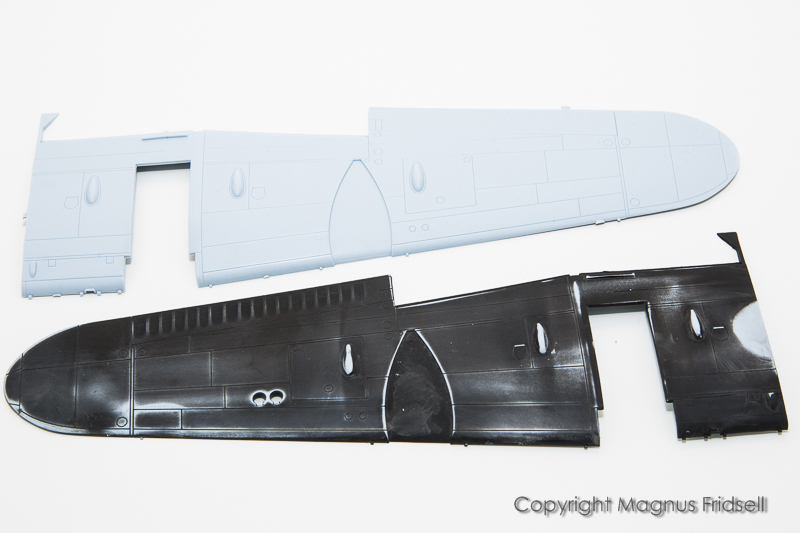 Som more airframe work with the cowling around the upper turret and the loose rear end of the fuselage in place. The tailplanes were a tight fit, once more very cleverly designed but they needed some adjustment to snap in place. 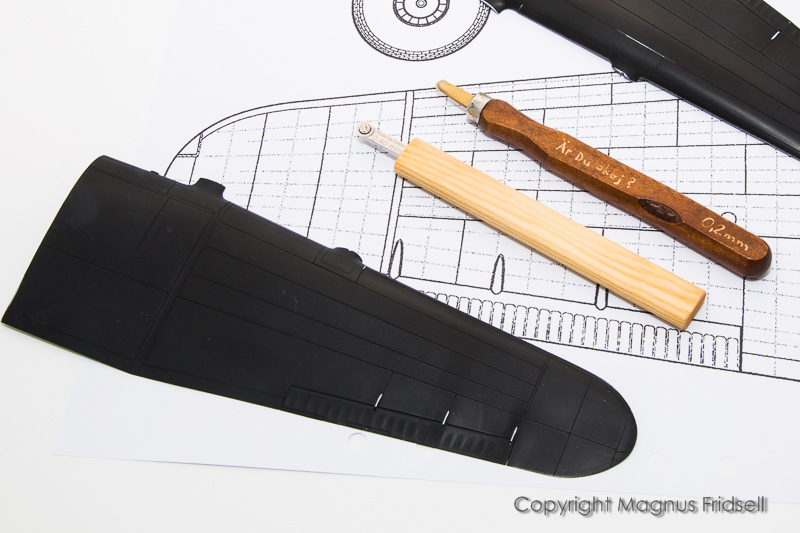 Good progress on your Lanc, Magnus! 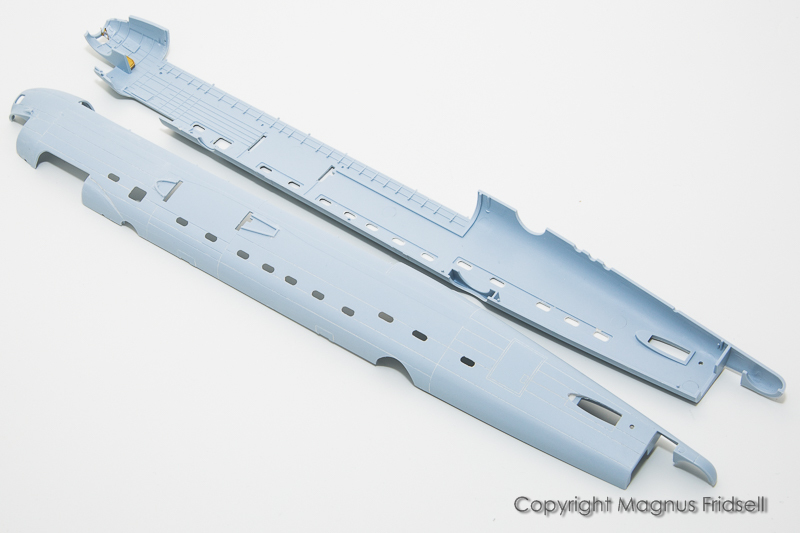 It's annoying when those sink marks and ejector pin marks are on the visible side of the kit. Take your time, in the end it will be worth it. Our great hobby is a slow and time consuming hobby but it learns us to be patient in a world full of impatience. I'm surprised to hear that the fitting isn't perfect. Isn't it a new Airfix kit?